Students will use this Evidence of Evolution lab station to learn about how scientists have proof for evolution by natural selection. 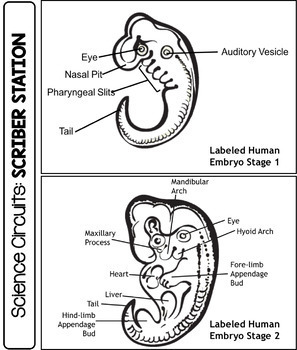 With science as the primary background subject, students will learn about the genetics and its components by using Social Studies (which includes history, current events and geography), Technology (computers and engineering), ELA (reading and writing), the Arts (music, art, PE/dance and debate), and Math. 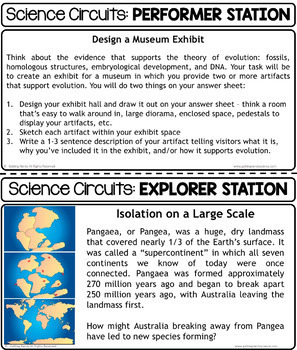 These print and go, low-to-no prep Science Circuit Stations are easy to implement with a few household items and provide a method for reinforcing life science that shows how science concepts flow across the curricula and are relatable in all aspects of life. 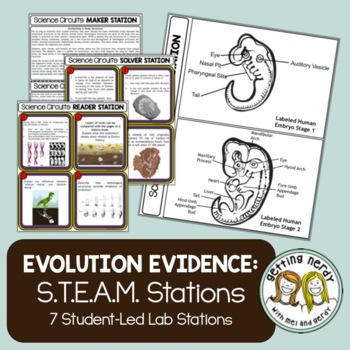 This product is found in our Life Science Bundle: Cross Curricular STEAM Stations which will include over 40 stations for all Life Science topics! Our STEAM stations are student-led activities that are great for enrichment, differentiation, assessment, group activities, mini-labs, and more! 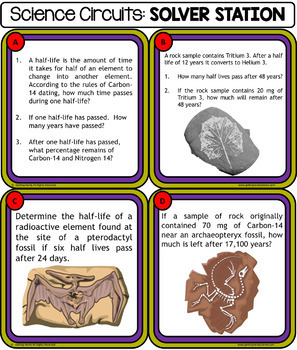 Students should go into the lessons with some background knowledge on each topic. These unit includes directions for each activity, answer keys, station signs, student answer sheets (which can be turned into an interactive notebook booklet), cover sheet, and blank answer sheets for your own stations. Explorer: As an explorer, students engage in Social Studies, Geography, and History as they learn about current events, historical figures and events, etc. Researcher: Students use a computer, smart phone, ipad or other electronic device to research related topics. Maker: This station entails students taking on the role of engineering, designing, building, assembling, and/or experimenting with manipulatives. Scriber: At this station, students write a response to a question or problem. Reader: Students answer questions related to a reading passage . - Purchase of the product is for single classroom use by the purchaser only. It is a violation for individuals, schools, and districts to redistribute, edit, sell, or post this item on the Internet or to other individuals. Disregarding the copyright is a violation of the Digital Millennium Copyright Act and subject to legal action. Clipart and other elements within our products are copyrighted and cannot be used on its own without permission or license. Cross-Curricular STEAM Circuits Science Stations by © 2016 Getting Nerdy. All rights reserved.